Preheat oven to 425 F. Line a 9-inch pie pan with pastry dough. In a large bowl, toss the blueberries, corn starch, flour, sugar, vanilla extract and lemon juice. Spoon or mound into pie shell. Dot with the unsalted butter. Wet pie edges with a bit of water. Roll remaining pastry to fit top of pie. 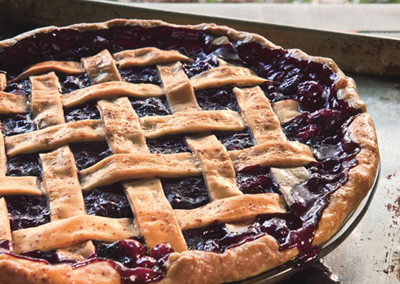 Place on pie and press securely onto fruit and edges to seal. Reduce heat to 375 F. and bake until juices begin to bubble through steam slits (about 35 to 45 minutes).